We are Anna and Dave, two environmentalists who had been working London office jobs for several years. We were becoming discontented with our lifestyles and wanted to be outdoors, helping people and wildlife. We decided to quit our jobs and have an adventure with a purpose. Having read about Rewilding Europe and the rewilding areas in Europe, we wanted to learn more about them, see the challenges and successes, and get involved. So we set off on a bike tour! We got our bikes ready, rented out our apartment and started our adventure around Europe. Our first stop was very close to home – a rewilding project just south of London. We took 12 friends along for a day at Knepp Wildlands, a member of the European Rewilding Network and went on a safari. After riding for almost a month, we arrived at the Western Iberia rewilding area – Faia Brava, Portugal – where we stayed at the campsite for two weeks as part of our cycle tour of European rewilding areas. 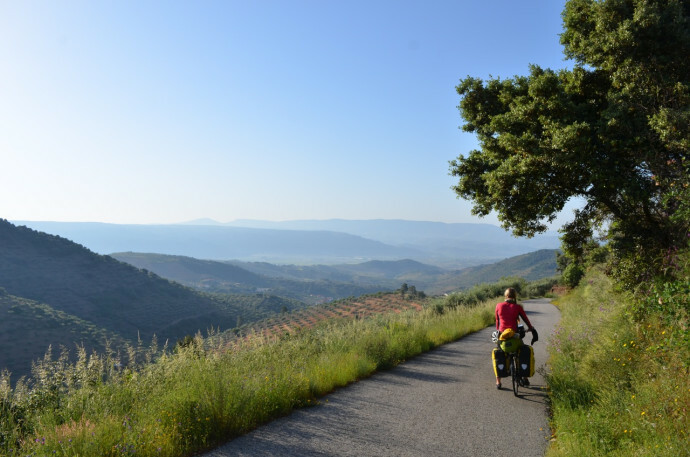 Our journey started in Santander, Spain, where we got off the ferry with our Tourino bicycles to ride towards the Western Iberia rewilding area. On the way, we saw beautiful mountain scenery, the famous town of Santiago de Compostela, the stunning nature reserve of Xures, and the Foz Coa museum of Paleolithic rock art. Faia Brava is run by Associação Transumância e Natureza (ATN) in association with Rewilding Europe. It boasts 650 hectares of land that was previously agricultural, purchased over the last 15 years. There are dry stone walls marking field boundaries, abandoned stone shelters, farm buildings, olive groves and almond trees. And everywhere you go, there is a carpet of wildflowers in bloom. The farmers in the past used the land and removed most of the vegetation, except the occasional cork oak tree near the boundary walls. These grand trees bear the marks of cork harvesting, the gnarled grey outer bark cut off to reveal the smoother darker bark underneath. The Faia Brava reserve was originally established for the bird nesting sites on the cliffs in the deep river valley along the Rio Coa. There are griffon vultures, black vultures, golden eagle and Bonelli’s eagle here. It was exciting to see them and realize that Griffon vultures have a 2.5-meter wingspan! Now that the reserve has been expanded to include a lot of land either side of the river, a herd of free-roaming Garrano horses and some wild Maronesa cattle have been introduced as wild-living, social herds. Their presence is important in maintaining the biodiversity – large herbivores were naturally here before people started farming the land. The rock art in this region from the Paleolithic period (~22,000 years ago) depicts deer, ibex, horse and aurochs. The aim at Faia Brava is to bring back natural grazing as a key ecological process, with animals that closely resemble their extinct ancestors. The Aurochs has been extinct since 1627 but the Maronesa cows in the reserve are part of the Tauros Programme – aiming to breed-back animal very similar to the aurochs and – at least as important – does the same job ecologically. As well as cows and horses, there are wild boar, badgers and genets here. We didn’t see any, as they’re secretive and nocturnal, but we’ve seen their scats. There are also signs that wolves are returning to the wider area, which is great news for nature because top predators help maintain balance; however there is a risk of conflicts with farmers, who are no longer used to protecting their livestock from wolves. A lot of work is going on at Faia Brava. There are researchers working on finding out what animals are present by using camera traps and searching for scats, people working with the vultures, and researchers working to reforest the area. When the shrubs were removed and grazers came in the trees would come back naturally, but it is a slow process. The seed banks are low because of decades of farming and fires. During one of our days in Faia Brava we spent the morning in the nursery transplanting holm oak and ash seedlings into larger pots. Then in the afternoon we were working with one of the student researchers to mark out plots across the reserve so that the regeneration of the forest can be measured every few years. During the evening we listened to the birds in the campsite as the sun set on the other side of the valley, turning the sky pink and red. We really enjoyed our stay at Faia Brava and were happy to help with some research and take part in various activities. It was an amazing experience and we would like to thank the Western Iberia team, ATN and Rewilding Europe for their hospitality. We are now heading to Catalonia, Switzerland and Germany to visit other members of the European Rewilding Network. You can follow our journey at www.forpeoplefornature.com where we are blogging and writing articles on the way.